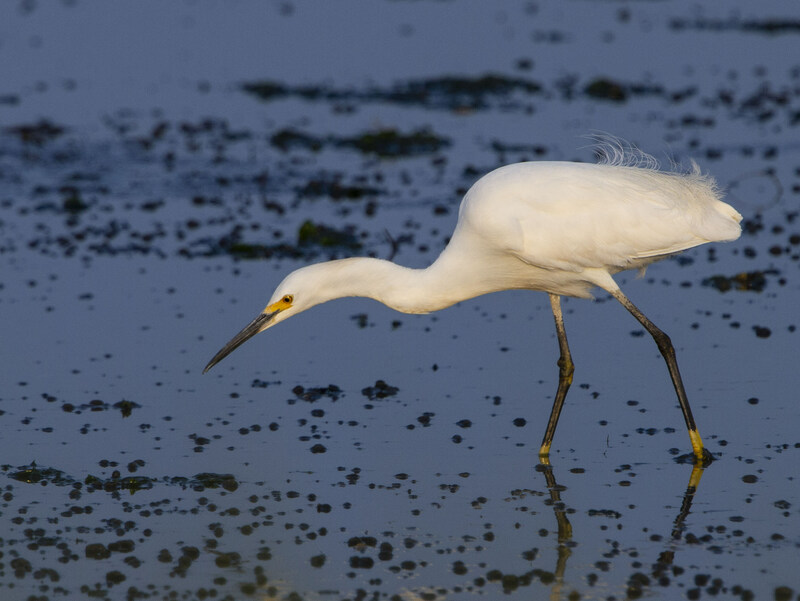 If you’ve never heard a male Snowy Egret nasally bubble away at a rival, well, you are in for a treat. 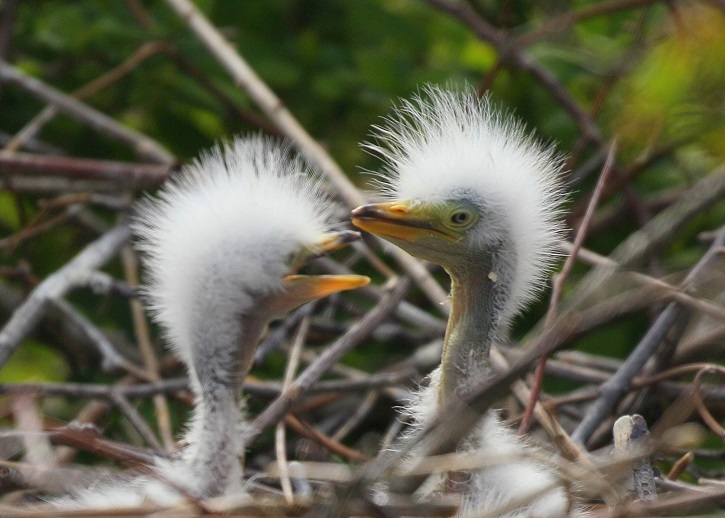 Using Xeno-canto, an online library of bird sounds to which anyone can contribute, we’ve chased down the strangest recordings of species native to Massachusetts. Hit the play button in the clips below to check them out! In the first half of this post, we’ll run through some strange bird noises that are easy to go out and hear for yourself. 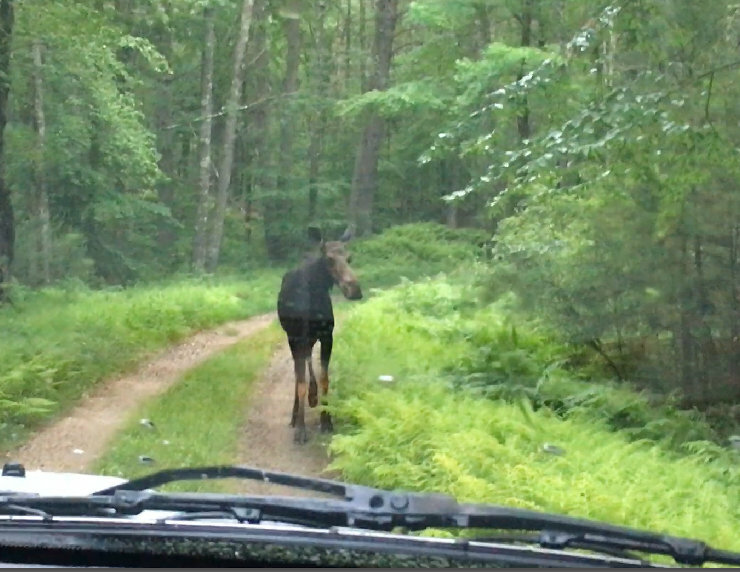 We’ll review even weirder noises in the second half, but ones that are hard or impossible to experience in Massachusetts. This second section is devoted to noises that migratory birds make on their breeding grounds far to the north, or in other parts of their range. Distant relatives of herons, bitterns make a booming, gulping noise while pumping their necks up and down, giving them the nickname “thunder-pumper.” Hit the play button in this clip and turn up the bass! A once-common sound of farm fields and grasslands, the Bobolink’s song incongruously brings to mind R2-D2 from Star Wars. 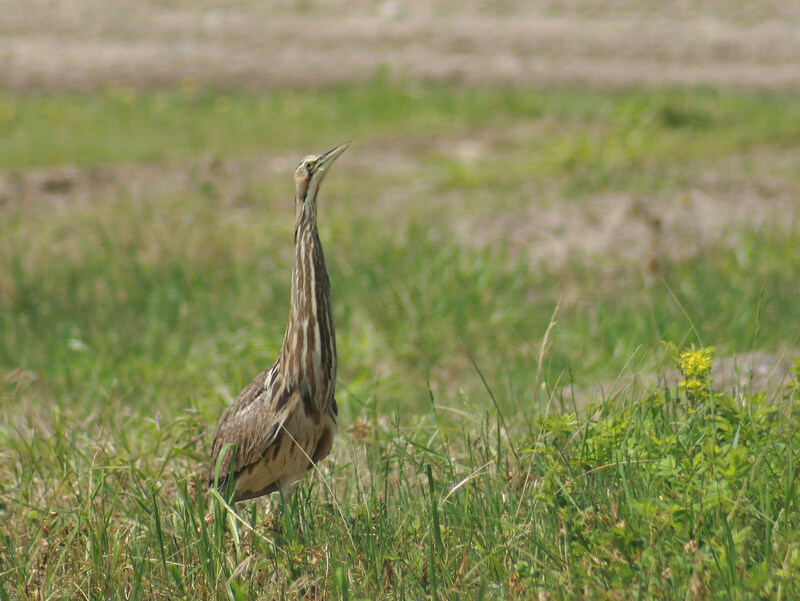 These grassland birds abounded during the height of low-impact agriculture in New England, but farmland loss, development, intensive harvesting and pesticide use have reduced their numbers dramatically. 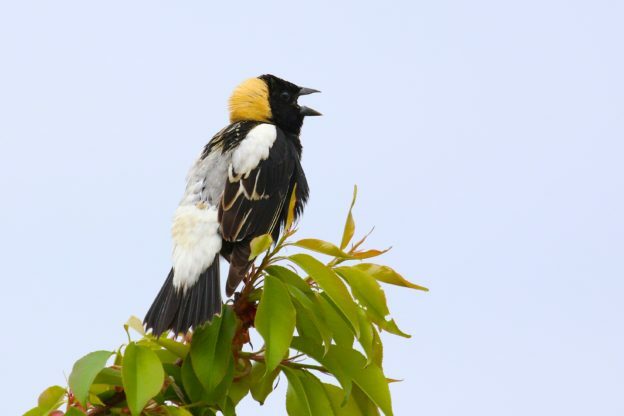 With recent conservation programs like the Bobolink Project, which pays farmers directly to protect grassland birds, this species’ future is looking a little brighter. Veeries are drab, russet-colored thrushes with an outsized voice. They can produce several clear tones at once, and almost sound like they are harmonizing with themselves. 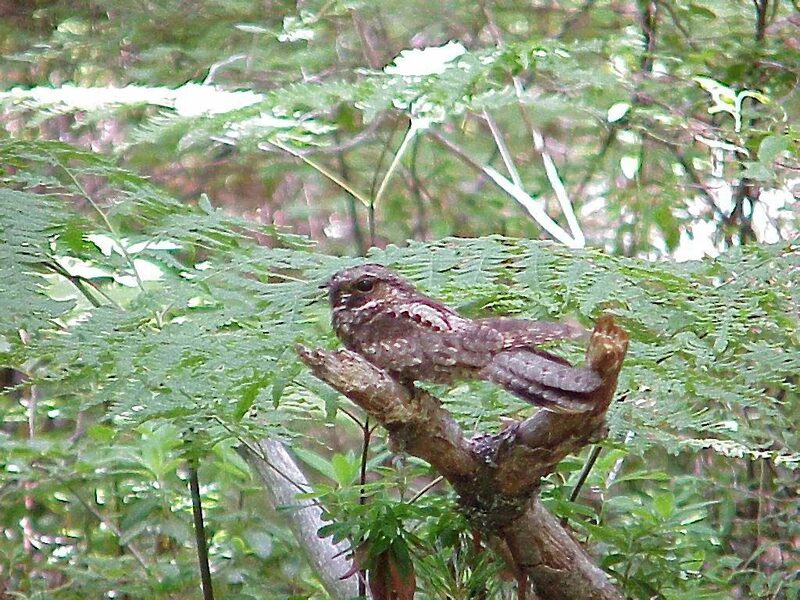 While uncommon near developed areas, this birds are one of the most numerous summer birds of deep forest far from the coast. Perhaps the most iconic sound on this list, the wail of the Common Loon is practically synonymous with the wilderness of northern New England (although they also breed in central Massachusetts). In this recording, listen for their yodels at the beginning, a loud wail at 0:31, and keening starting at 0:09 and 0:58. This might be the weirdest one on the list. 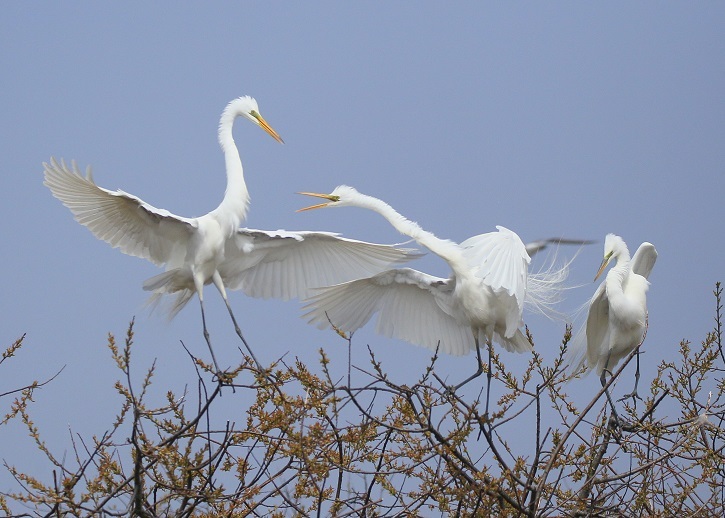 Graceful Snowy Egrets are common in New England saltmarshes, but rarely vocalize away from rookeries. At rookeries, however, they’re known for a cartoon character-like and downright hilarious. Pectoral Sandpipers and many other species of shorebirds seem like much different animals on their breeding grounds than on the east coast during migration: they become quite fearless and territorial, their plumage takes on dramatic patterns, and they sing with a surprising variety of chortles, whoops and whistles. This Pectoral Sandpiper’s song sort of sounds like… somebody blowing bubbles? Turkey Vultures almost never vocalize. When they do, all that comes out is a raspy, sizzling hiss, like adding water to a hot pan. While puffins are uncommon winter visitors to the waters off MA, you can easily hear their characteristic grumbles on breeding colonies in Maine. 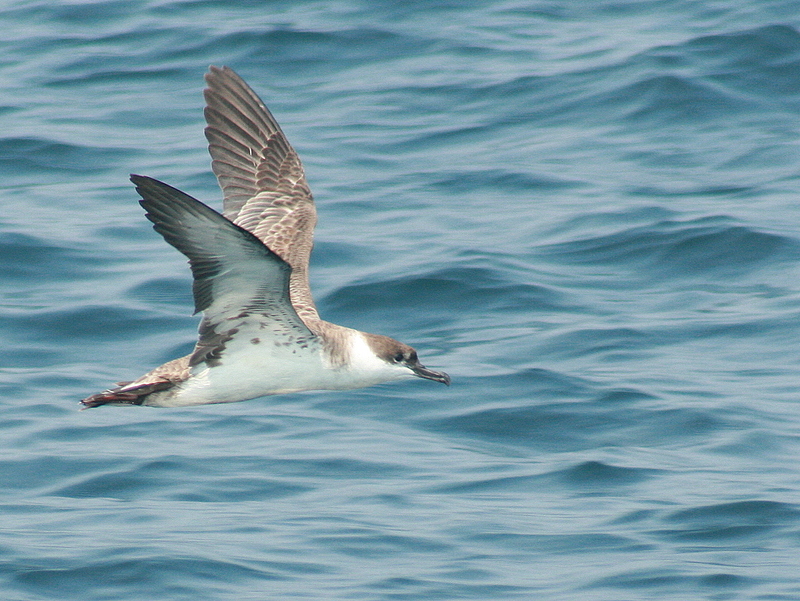 These pelagic, albatross-like birds are frequently encountered on whale watches and offshore boat trips in Massachusetts waters. While silent at sea, they’re… really quite vocal on breeding colonies, where they sound like rubber chickens brought to life. These are just our picks for the strangest noises made by local birds… but there are so many other options, it’s hard to winnow them down to just a few! What would make your top ten? Let us know in the comments! This entry was posted in Birds and Birding and tagged bird noises, bird recordings, birdsong, weird bird noise, weird bird noises, xeno-canto on July 23, 2018 by William Freedberg. 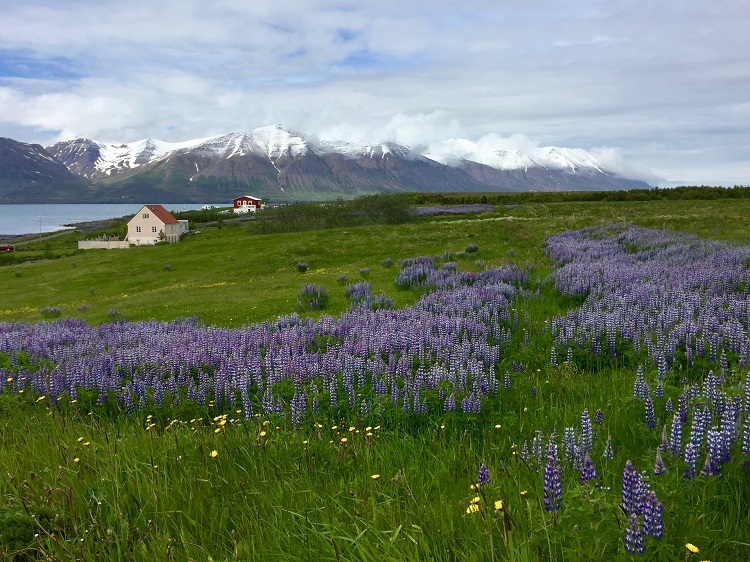 While it’s true that Mass Audubon regularly sponsors outstanding wildlife and birding trips to exotic corners of the planet, the Natural History Travel Program also features domestic departures that rival some of the finest wildlife spectacles on the planet. 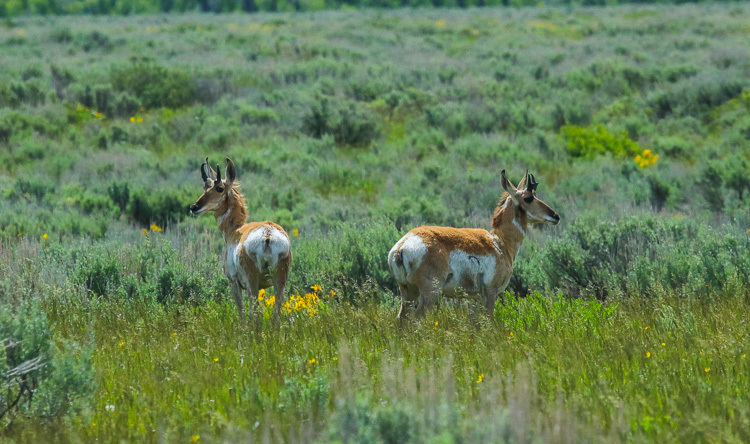 One of these is the Greater Yellowstone Ecosystem—a region covering approximately 34,375 square miles in the northwestern corner of Wyoming, but also extending into Idaho and Montana. Comprised of more than 2.2 million acres, this scenically magnificent region with an elevation averaging over 7500’ hosts the largest concentration of wildlife in the United States outside of Alaska, including the largest free-ranging herd of American Bison in the world, one of the largest American Elk herds in North America, and one of very few Grizzly Bear populations in the contiguous United States. And thanks to a repatriation effort in the mid-1990s, Yellowstone supports 11 packs of Gray Wolves numbering approximately 110 individuals. 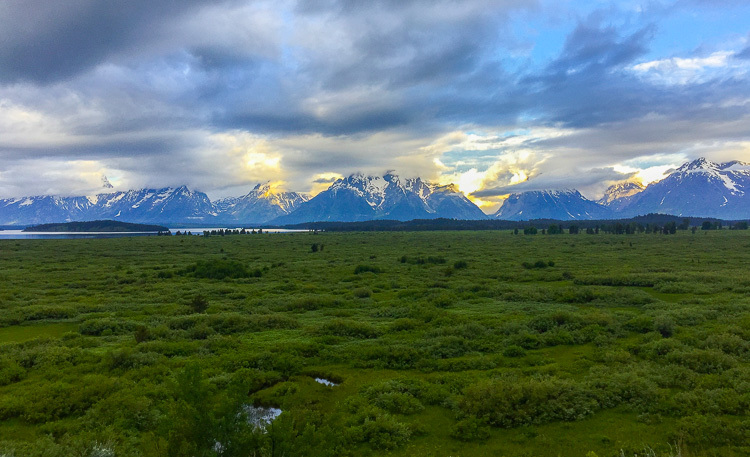 From June 12-22, Mass Audubon President, Gary Clayton and Important Bird Areas Director, Wayne Petersen were able to share 21 species of mammals and 133 species of birds with an appreciative and congenial group of colleagues and clients in this extravagantly beautiful region. Among the trip’s highlights was a wolf pack trying (in vain) to take down a young Pronghorn, baby bison practically at every turn, a Golden Eagle at its nest, a Dipper feeding and teaching a young one how to swim and dive, a fine variety of waterfowl including several pairs of rare Trumpeter Swans, and hosts of colorful wildflowers. In addition, the food was hearty and fine throughout, the weather was variable but comfortable, and canoodling Grizzly Bears and Moose and Black Bears with young were consistently voted as favorites. One of the most intact temperate zone ecosystems in the world, the Yellowstone is a region like few others and is destination that every American should see at least once in their life! 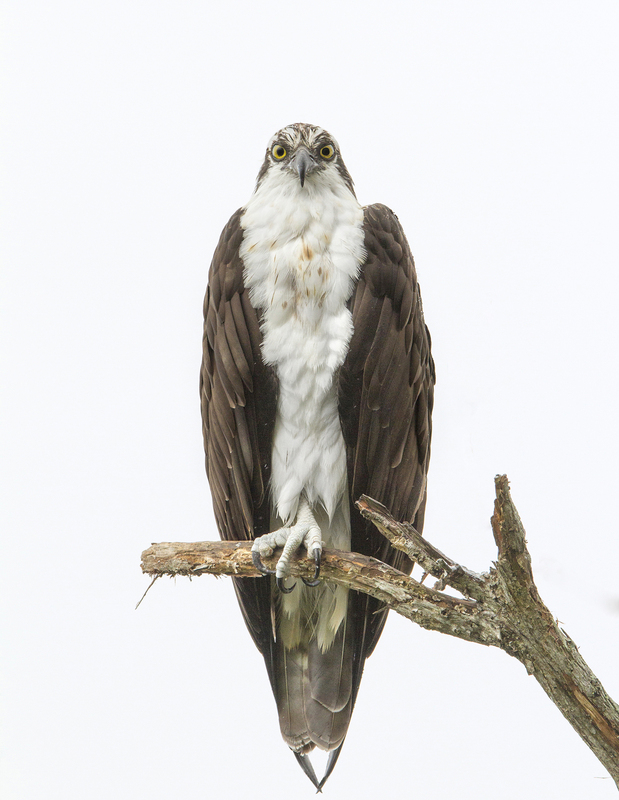 This entry was posted in Birds and Birding, Where in the World? 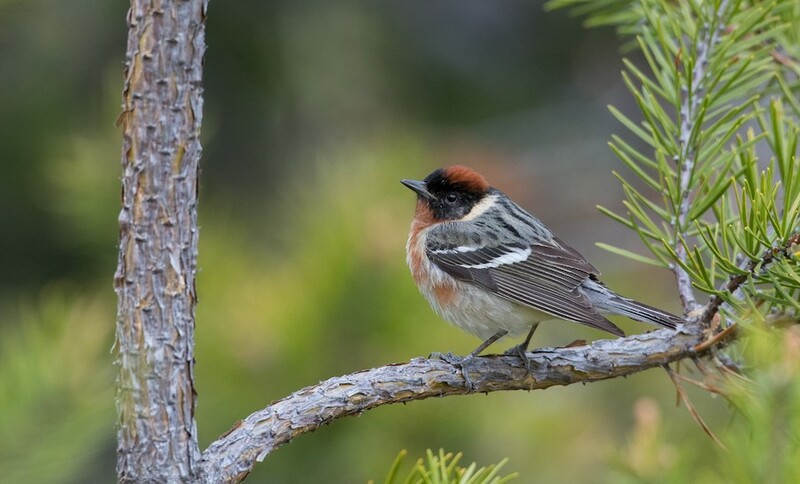 and tagged birding yellowstone, natural history travel on July 18, 2018 by Wayne Petersen. This summer, I’ve been surveying birds at the Quabbin Reservoir for Mass Audubon and NEON, the National Ecological Observatory Network. 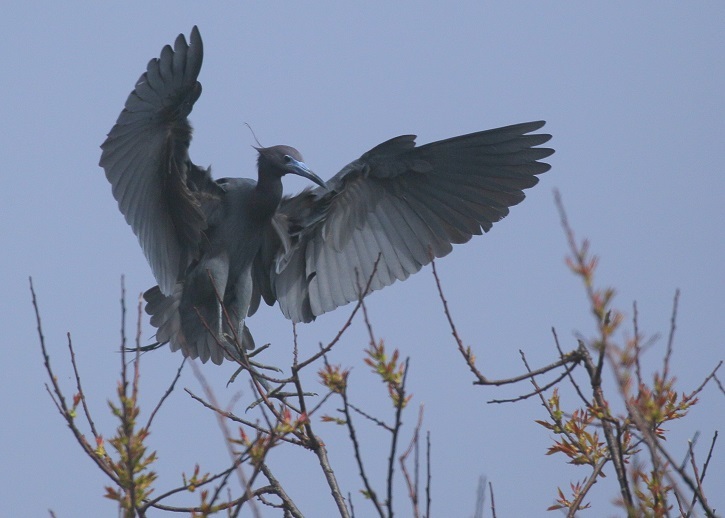 The deep forests and hollows of the Quabbin watershed host scarce breeders like Cerulean and Canada Warbler, along with most common woodland breeders in the state. The Quabbin’s size and diversity of intact habitats make it an ideal study site for a program like NEON. NEON is an exciting project because of its scale. Funded by the National Science Foundation, the network comprises more than 80 sites across the country’s 20 ecoregions. At each site, NEON coordinates teams of scientists to keep tabs on a variety of ecological indicators. 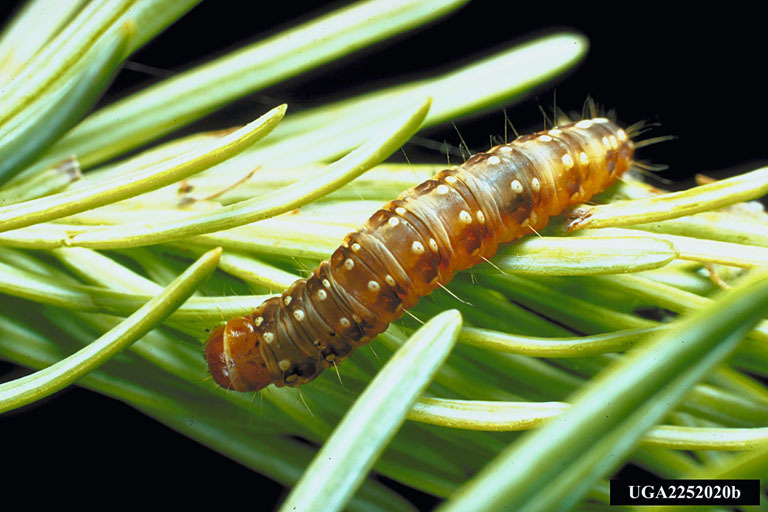 These include large-scale factors like water chemistry, greenhouse gasses, and tree cover, as well as narrower topics like fish DNA, bird diversity, and disease prevalence in ticks, mice and mosquitoes. 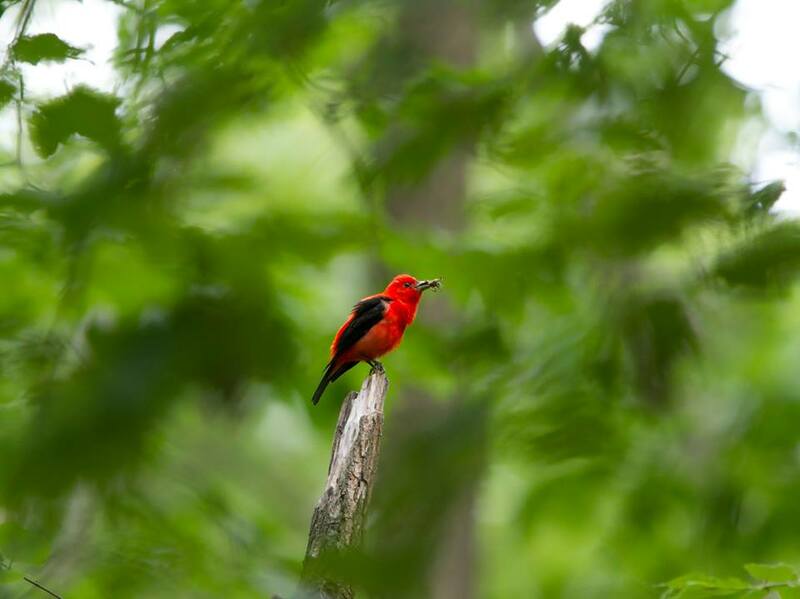 A Scarlet Tanager with insect prey, perched on a snag by the Quabbin. Photo by Will Freedberg. NEON treats birds as one piece of a vast puzzle: by studying how long-term ecological trends line up with each other, the project aims to parse out the causes and consequences of environmental change. Most importantly, all NEON data is free and publicly available. It’s fun to browse if you’re curious about any of these topics, but scientists can also leverage these massive datasets to answer specific questions about ecosystem function. Mass Audubon has been responsible for NEON’s bird data in New England since the project’s inception. 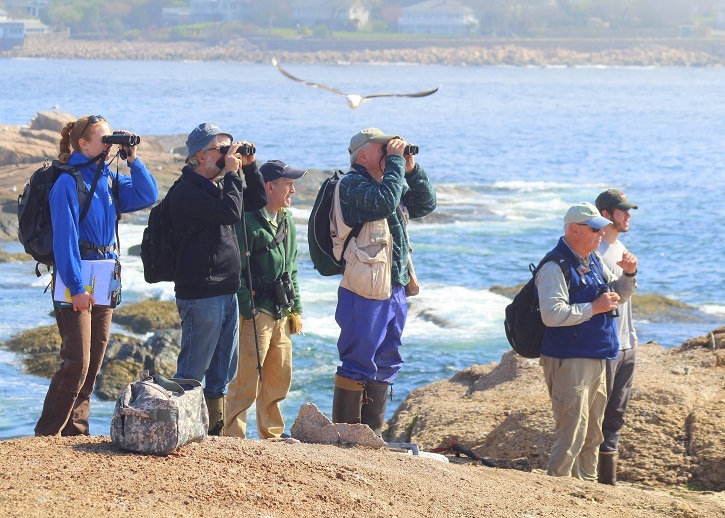 Each year, we send observers (called “field technicians”) to monitor bird numbers and diversity at the Quabbin, as well as Bartlett Forest in New Hampshire. Technicians are responsible for surveying a number of randomly selected patches of forest, which are each divided into 3×3 grids of survey points. 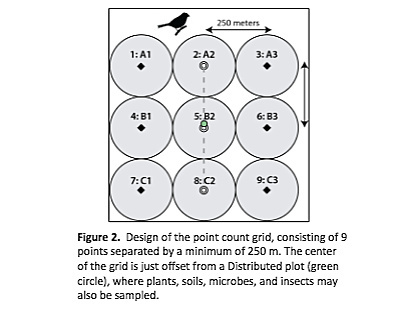 By standing in one place and counting birds at each evenly spaced point in a grid, the technicians minimize double-counting birds, and get a representative subsample of birds present in each grid. Even skilled birders won’t detect every bird at a point. To get around this, NEON scientists adjust bird count data with models that account for birds that were present, but undetected by the observer. Observers are also less likely to detect birds that are far away from them, and more likely to notice birds that are close by. So, field technicians record their distance from each bird with a rangefinder; distant birds are given more “weight” in the model for calculating actual bird abundance. This is based on the assumption that the technician recorded most nearby birds, but missed more that were further away. Next week, I’ll be posting some entries from my field notebook, and a typical day in the life of a Mass Audubon/NEON bird technician. Stay tuned for some stories from the field. 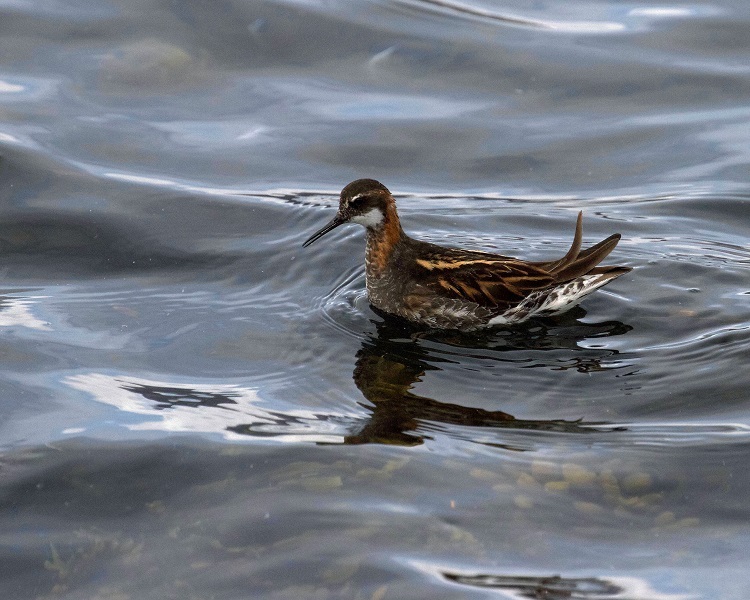 This entry was posted in Birds and Birding and tagged Bird surveys, Birding Quabbin Reservoir, Field Tech, National Ecological Observatory Network, NEON, Point Counts, Quabbin Birding on July 11, 2018 by William Freedberg. William Brewster, the famous 19th-century ornithologist and Cambridge resident, imagined that spring migrants preferred the rural countryside west of Boston to the woodlands near the city. But when he moved to Concord in 1892, he was surprised to find fewer migrants than he had become used to seeing in Cambridge. Brewster’s student, Ludlow Griscom, hypothesized that this was the result of birds’ migratory routes. Brewster’s data, collected over decades, seemed to show that migrants did not move evenly across the state, but rather took routes based on the shape of the landscape. Paraphrased, Griscom’s theory went like this: a big stream of birds passes up the mid-Atlantic coast, and two major contingents form in New York. One, with many inland migrants, would hit the Hudson river valley and follow it north, and the other would travel along the Connecticut coast. 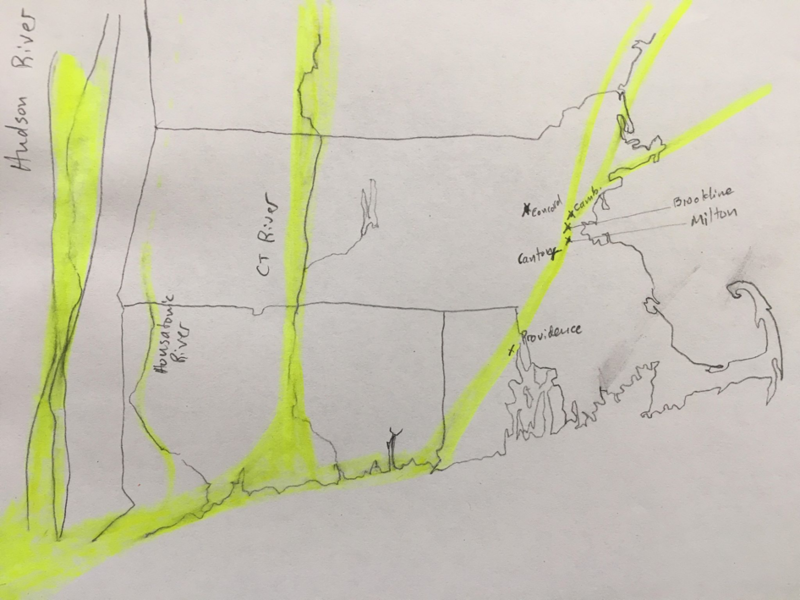 A small contingent of birds would then split off and follow the Housatonic River, and a major one would follow the Connecticut River Valley. The rest turn northeast just ahead of Narraganset Bay to avoid the pine barrens of southeastern Massachusetts and Cape Cod. These birds turn north near Boston Harbor, passing through Canton, Milton, Brookline and Cambridge, before continuing north into Essex County and along the New Hampshire coast. This particular set of routes has not been borne out by modern data gleaned from the radar. 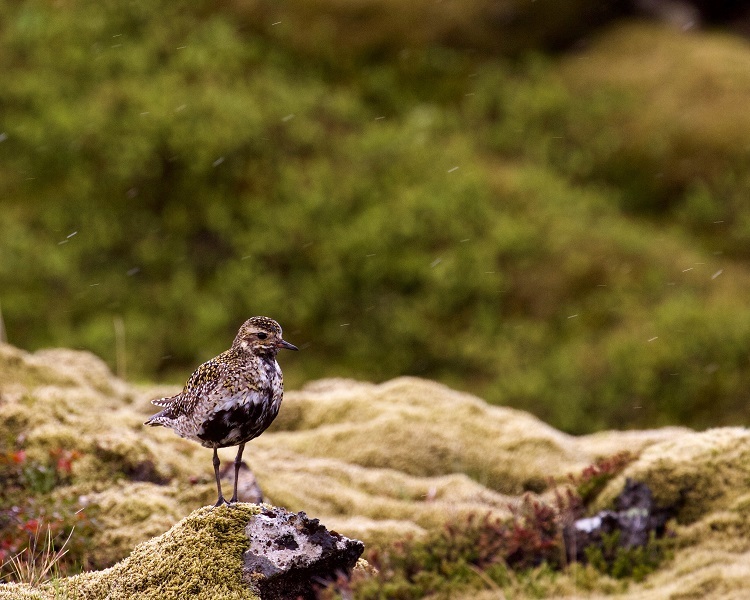 While some studies show that certain areas are regularly “birdier” than others during migration, (including sites along major river valleys), wind and weather patterns ultimately have more sway over bids’ trajectories than the topography of the landscape. 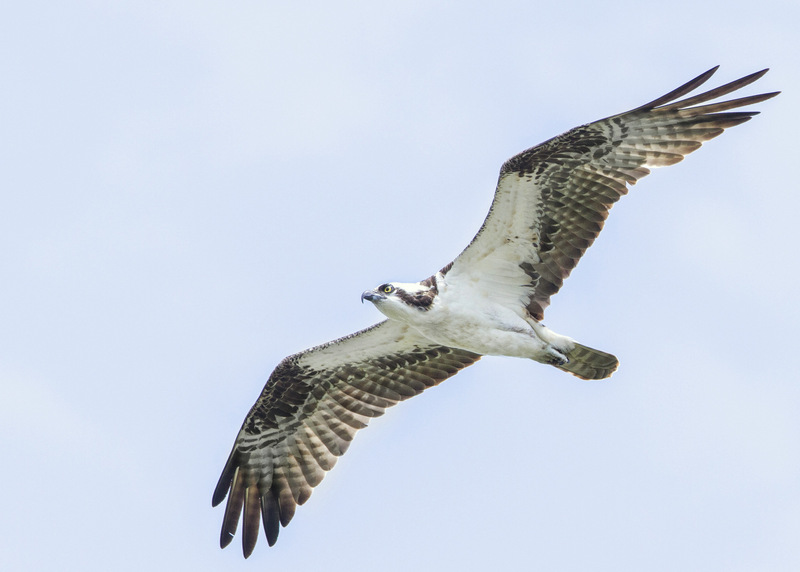 Some expert birders still swear that migrating birds following “sight lines” or topographic features, but these observations remains anecdotal. Even if migratory routes are not as fixed or as specific as Griscom imagined, radar does often show higher concentrations migrants in some areas than others. 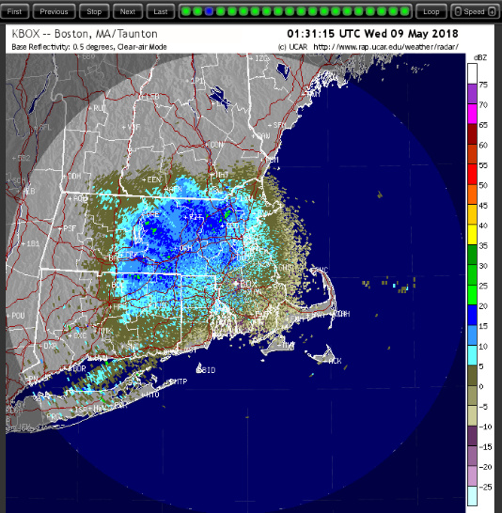 For example, in early May 2018, birds seemed to avoid southeastern Massachusetts and Boston, staying northwest of I-495. 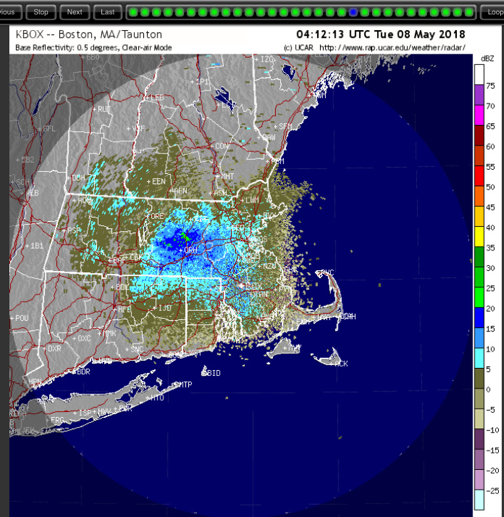 This is demonstrated on the radar maps below (note that the radar station is the white cross in the center of the circle, and that radar can detect birds equally in all directions- check out our blog series on reading radar images if you haven’t yet!) Bear in mind that these are by no means typical nights—birds take very different migratory paths through Massachusetts every night, mostly depending on wind direction and time of year. While the radar doesn’t show nocturnal migrants grouping together in narrow ribbons in the air, compiling images like these helps scientists observe patterns in bird migration. For example, this map by Kyle Horton of the Cornell Lab of Ornithology shows the direction in which birds are heading. The length of each bar shows how many birds are flying in that direction over the course of a season. 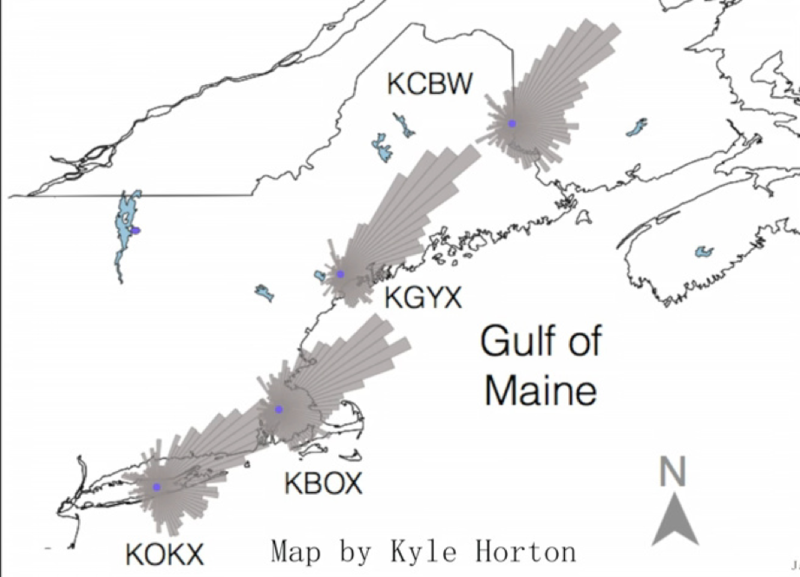 The key takeaway: many birds fly over the ocean from Massachusetts, preferring to take the direct route over the Gulf of Maine rather than follow the coastline. This map was recently featured in an awesome video by Jackson Childs, a local birder and friend of Mass Audubon. 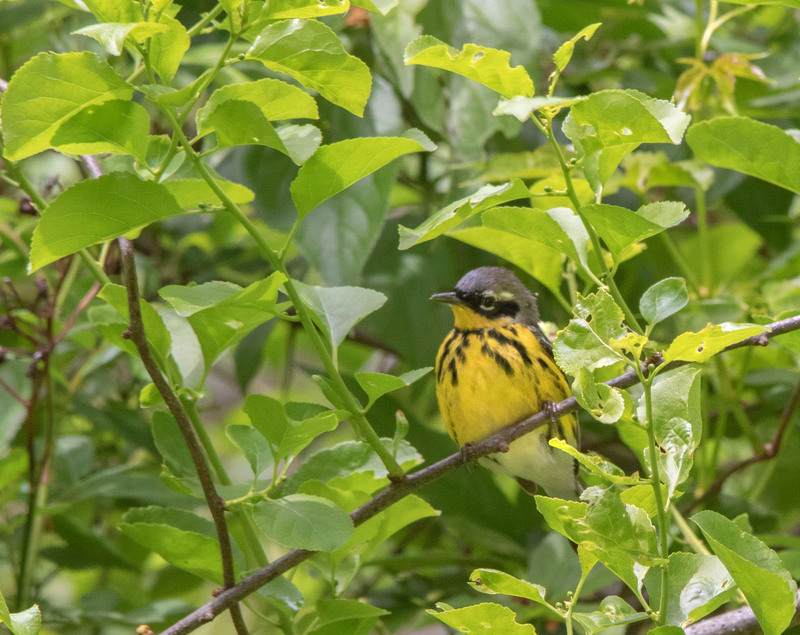 Check out Jackson’s video for more cool information about bird migration, including dawn flight, and some close-up footage of colorful warblers. 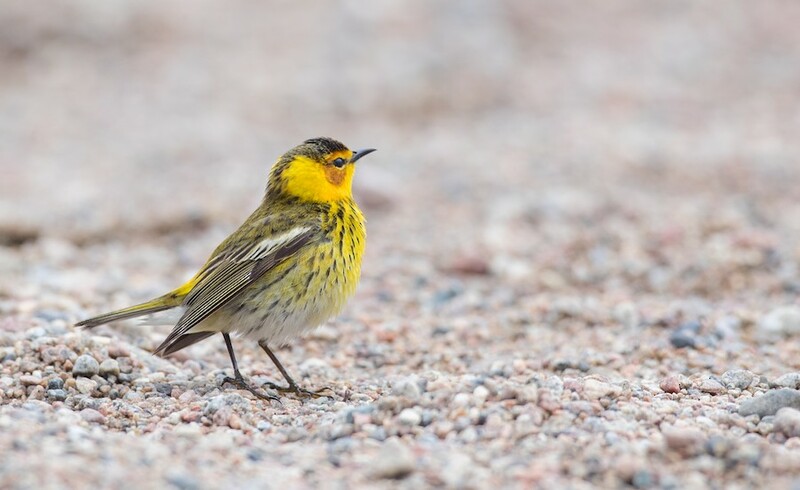 If you’ve found surprising patterns in spring migration, let us know in the comments! This entry was posted in Birds and Birding, History and tagged birding, birding by radar, ludlow griscom, warbler migration, william brewster, william brewster ornithologist on May 22, 2018 by William Freedberg.